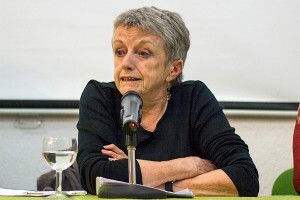 LISTEN TO DOREEN MASSEY NOW! Nigel Warburton:So, in your own work about space what do you focus on? A lot of us, I think, implicitly think of space as a kind of flat surface out there -we ‘cross space’ — and space is therefore devoid of temporality: it is without time, it is without dynamism, it is a kind of flat, inert given. Nigel Warburton:You’ve criticised this notion of ‘developing’ countries and ‘underdeveloped’ countries and the implication that this is all in one trajectory towards ‘developed’ countries on the model that we in the West have. What can you do to persuade those who believe in that story? I mean how can you convince somebody who is in the grip of that ideology that they’re wrong? Nigel Warburton:Is it just a case that each society wants to project its version of reality onto the rest of the world? Nigel Warburton:Are there other ways in which space and politics link together? Nigel Warburton:Doreen Massey, thank you very much. This entry was posted in Audio, Communication, Public Engagement, Resources, Social Science Bites and tagged Doreen Massey, geography, Social Science and Science, Space. Bookmark the permalink. Post a comment or leave a trackback: Trackback URL.